Violinist William Terwilliger has enjoyed an exceptionally active and diverse career as a soloist, recitalist, chamber musician, orchestral musician and teacher on six continents. As soloist with orchestra, Mr. Terwilliger has performed with orchestras on throughout the world, including the National Orchestra of Bolivia (La Paz), the Orchèstre des Alpes Maritimes (Nice, France), the Nanning Festival Orchestra (China), the National Orchestra of Ghana (Accra), the Toledo Symphony, the Boulder Chamber Orchestra (CO), the South Carolina Philharmonic and the Long Bay Symphony. 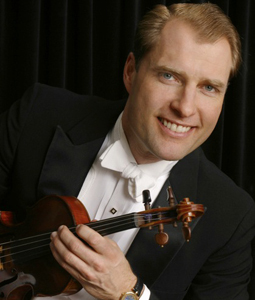 Currently concertmaster of the Long Bay Symphony in South Carolina, he has also performed with the Rochester Philharmonic and the Brevard Music Center Festival Orchestra, and served as concertmaster of the Boulder (CO) Bach Festival Orchestra. Mr. Terwilliger has collaborated for 20 years with pianist Andrew Cooperstock as Opus Two, and the duo hasperformed throughout the US, and in Latin American, Asia, Africa and Europe. Recent performances by Opus Two include recitals at Merkin Hall, the Barge Series and le Poisson Rouge in New York, at St. John’s Smith Square in London, at the HellHot Music Festival in Hong Kong, and had recital and concerto performances during a two month tour of China, Korea, Japan and Russia in 2007. Opus Two has also performed for the Australian Festival of Chamber Music (Queensland), the Piccolo Spoleto Festival (SC), Maverick Concerts (NY) and at summer festivals including Round Top (Texas) Rocky Ridge (CO) and Brevard (NC). Their performances have been heard over NPR, the BBC, Radio France, as well as Latvian and Australian National Radio. Opus Two’s discography includes single composer CD’s of Aaron Copland (Azica), Lowell Lieberman (Albany), Paul Schoenfield (Azica), and Leonard Bernstein (Naxos). Currently professor of violin at the University of South Carolina, Dr. Terwilliger is a gifted pedgogue, and has given master classes throughout the US and in Europe, Asia, Australia and Africa, and has presented at national conferences of the College Music Society, Music Teachers National Association, and American String Teachers Association. He has judged national string competitions for MTNA and the National Federation of Music Club and has contributed articles to the American String Teachers Association national journal, and for The Strad and Strings magazines. Mr. Terwilliger received his doctorate from the Eastman School of Music where he studied with Zvi Zeitlin and Donald Weilerstein.